Without question one of the strongest areas of the Buffalo Bills defense in 2017 was their defensive backfield. What makes that a remarkable feat is every starter last year was not with the team the previous season. The 2017 starting defensive backfield was Jordan Poyer and Micah Hyde at the safeties and E. J. Gaines and Tre’Davious White at the corners. That group accounted for 305 total tackles and 15 interceptions last year. The defensive backfield as a whole had 16 interceptions which meant the Bills defensive backfield was among the best in all the NFL at getting interceptions. In 2018, three of the four starters return. The only loss was E.J. Gaines who went to the Cleveland Browns as an unrestricted free agent. Replacing Gaines will be 10 year vet Vontae Davis, who was a former first round pick of the Miami Dolphins but spent most of his career with the Indianapolis Colts. Davis only participated in five games last year because of a leg injury but in the previous five seasons with the Colts he had 13 interceptions. At 5’11, 205 pounds. Davis has excellent corner size and he has a consistent overall game being able to play man, zone and support the run. As good as Gaines was a year ago, Davis is an upgrade at the position. The two safeties, Micah Hyde and Jordan Poyer, don’t have great size but both are very instinctive, can play the run as well as cover and have outstanding ball skills. They are ideal players to play at the backend in Sean McDermott’s scheme. The main backup at safety in 2018 will be free agent addition Rafael Bush, who was with New Orleans last year. Bush has starting experience during his career and is also a valuable special teams performer. The other backup will be newcomer Kelcie McCray, who was with Seattle last year. Kelcie has more size than the other Bills safeties at 6’2, 202 pounds and is a very physical performer. What he lacks is the ball skills of the others, as he does not have any interceptions for his career. 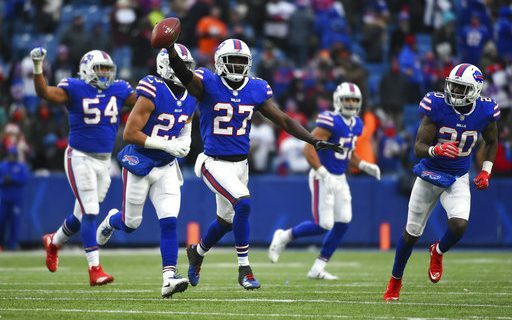 The corner opposite Vontae Davis will be second year man Tre’Davious White, who had an outstanding rookie season with 53 total tackles and four interceptions. White and New Orleans Saint Marshon Lattimore were easily the two best rookie corners in the NFL last year. White did not play like a rookie, but rather a multi-year vet. He has outstanding instincts and should compete for Pro Bowl honors very early in his career. Who plays as the third corner will be figured out in training camp later this month. In free agency the Bills signed Phillip Gaines, who was a valuable backup and part time starter for Kansas City the last four years. The interesting guy to watch in training camp is rookie fourth round draft pick Taron Johnson from Weber State. Johnson has ideal slot corner traits and showed in college he can play man or zone. His ball skills are excellent and he is a consistent tackler. The other rookie who could earn playing time with a strong camp is fifth round pick Siran Neal from Jacksonville State. Neal has experience at both corner and safety and could play either. With his size and physical play, the Bills could also try Neal as a nickel linebacker where his cover skills would really help the defense. Overall, the defensive secondary for the Buffalo Bills is one of the stronger if not the strongest position groups on the team. While there is a lot of experience with the group they are relatively young guys, which means this group could play together for quite some time. Greg has also broken down other Bills positions, including linebackers & defensive line.